If you are interested in or have questions about anesthesia, whether you are a patient, the loved one of a patient, or a medical professional, you will find Dr. Friedberg’s insights interesting and useful. We welcome your questions and invite you to submit them on the Contact Us Page. Posted on November 15, 2015 at 4:39 pm. The injected anesthetic propofol seems to be less likely to cause cognitive difficulties after surgery than inhaled anesthetics. Q. After reading your column on the aftereffects of anesthesia, I want to share my own experience. I had severe memory lapses for months after undergoing anesthesia. It was like knowing something was in a filing cabinet, but not being able to see what is in the folder. It is frustrating to know the information is there, but you can’t access it. Thankfully, my brain function did return to normal, but it took months. My physician suggested propofol for future surgeries. I have needed anesthesia a few more times over the last several years and have not experienced aftereffects again. A. Post-operative cognitive decline is surprisingly common, though the cause remains controversial. Propofol is an injectable anesthetic. One study showed less impairment among patients getting propofol compared to those getting the inhaled anesthetic sevoflurane (Clinical Interventions in Aging, online Sept. 24, 2014). It makes sense to ask the surgeon ahead of time if a peripheral nerve block would be appropriate. In some cases, such as knee surgery, that may be another option (Clinical Interventions in Aging, online Feb. 18, 2014). People who find that they are spacey or forgetful after surgery should be patient with themselves. In most cases, the cognitive problems (which may also be linked to insomnia) will disappear over time. 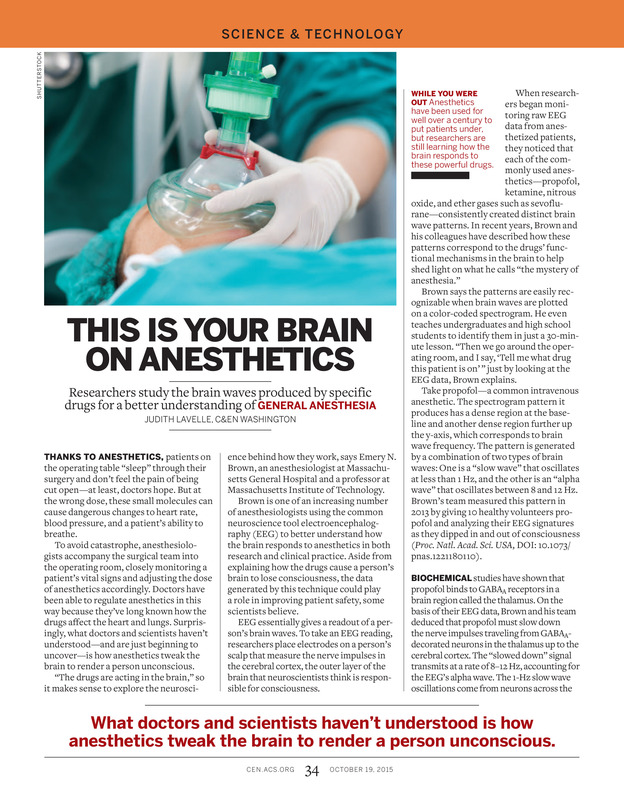 Anesthesia providers can only guess how much anesthetic you might need. Without a brain monitor, one American patient dies every day from anesthesia over medication. Prior to 1996, to insure an adequate experience, we tend to err on the side of too much. Since the FDA approval of the BIS brain monitor, it is now not only possible but also highly desirable to directly measure individual response to avoid brain fog (aka postoperative cognitive dysfunction or POCD). Watch You Tube ‘Going under with Goldilocks anesthesia.’ Learn what you need to know by reading ‘Getting Over Going Under.’ Complimentary copies from www.goldilocksfoundation.org. DISCLAIMER: Neither I, nor my non-profit Goldilocks Anesthesia Foundation, receive financial support from makers of the BIS monitor. Posted on November 5, 2015 at 5:35 pm. Postoperative delirium is preventable in up to 40% of such cases,6 with a proper screening program, the identification of risk factors and the implementation of evidence-based monitoring methods within the OR. Brain function monitoring-guided anesthesia dosing may decrease the rate of postoperative delirium.6,7,11,12 Monitoring with Bispectral Index™ (BIS™’) technology during surgical procedures gives anesthesia providers the ability to directly monitor the anesthetic effect on the patient’s brain to optimize the anesthetic dosing for the individual. de Lange, E., Verhaak, P.F., van der Meer, K. Prevalence, presentation and prognosis of delirium in older people in the population, at home and in long term care: a review. Int J Geriatr Psychiatry. Feb 28, 2013. Selinger, S. Preventing Hospital Delirium. The New Old Age blog. New York Times Website. November 11,2011. Accessed March 6, 2015. Inouye, Sharon K. et al. Postoperative Delirium in Older Adults: Best Practice Statement from the American Geriatrics Society. lntraoperative Measures to Prevent Delirium. J Am Coll Surg. 2014;220;2 ,136-148.e1. Leslie, D.L., Marcantonio, E.R., Zhang, Y., Leo-Summers, L., & Inouye, S.K. (2008). One-year health care costs associated with delirium in the elderly population. Archives of Internal Medicine. 168(1), 27-32. Whitlock, E.L., Torres, B.A., Lin, N., Helsten, D.L., Nadelson, M.R., & Mashour, G.A. (2014). Postoperative delirium in a substudy of cardiothorac ic surgical patients in the BAG-RECALL clinical trial. Anesthesia & Analegesia. 118(4),809-817. Sieber, F.E., Zakriya, K.J., Gottschalk, A., Blute, M.R., Lee, H.B., Rosenberg, P.B., Mears S.C. Sedation depth during spinal anesthesia and the development of postoperative delirium in elderly patients undergoing hip fracture repair. Mayo Clin Proc. 2010 Jan;85(1):18-26. Rubin, F.H., Neal, K., Fenlon, K., Hassan, S., Inouye, S.K. Sustainability and scalability of the hospital elder life program at a community hospital. J Am Geriatr Soc. Feb 2011;59(2):359-65. Radtke, F. M., Franck, M., Lendner, J., Kruger, S., Wernecke, K. D., & Spies, C. D. (2013). Monitoring depth of anaesthesia in a randomized trial decreases the rate of postoperative delirium but not postoperative cognitive dysfunction. Br J Anaesth. 2013; 110: i98-105. Kaplan, L.J., Bailey, H. Bispectral index (BIS) monitoring of ICU patients on continuous infusion of sedatives and paralytics reduces sedative drug utilization and cost. Crit Care Med. 2000;4(Suppl):S110. Gan, T.J., Glass, P. S., Windsor, A., Payne, F., Rosow, C., Sebel, P., & Manberg, P. (1997). Bispectral index monitoring allows faster emergence and improved recovery from propofol, alfentanil, and nitrous oxide anesthesia. Anesthesiology. 87(4), 808-815. Myles P.S., Leslie, K., McNeil, J., Forbes, A., Chan, M.T. Bispectral index monitoring to prevent awareness during anaesthesia: the B-Aware randomised controlled trial. Lancet. 2004;363(9423):1757-1763. White, P.F., Ma, H., Tang, J., Wender, R.H., Sloninsky, A., Kariger, R. Does the use of electroencephalographic bispectral index or auditory evoked potential index monitoring facilitate recovery after desflurane anesthesia in the ambulatory setting?Anesthesiology. 2004; 100(4):811-817. Posted on November 3, 2015 at 4:56 pm. Posted on October 19, 2015 at 5:32 pm. Can Too Much Anesthesia Cause Dementia or Brain Damage? Posted on August 25, 2015 at 1:59 pm. Posted on July 27, 2015 at 10:17 pm. I wrote you awhile ago with questions about my son and his surgery. I have a few more questions about his surgery. Which was yesterday. Posted on July 27, 2015 at 10:16 pm. Dr. Friedberg, a board certified anesthesiologist and author of “Getting Over Going Under: 5 Things You Must Know Before Anesthesia,” applauds the American Geriatrics Society guidelines to prevent postoperative delirium: “Brain monitoring is the best available technology to reduce or eliminate anesthesia brain fog after surgery and it needs to be more widely used as the study suggests. The vast majority of Americans are routinely over-medicated during surgery because their anesthesiologist is not measuring their brain. Posted on December 16, 2014 at 1:03 pm. The former article (http://www.medscape.com/viewarticle/771966#vp_2) was from 2012. This article (http://www.medscape.com/viewarticle/835292) is from November 2014. Posted on December 14, 2014 at 1:02 pm. Los Angeles, CA — The American Geriatrics Society (AGS) recently released its new Clinical Practice Guideline for Postoperative Delirium in Older Adults for providing essential guidance to clinicians to prevent and treat postoperative delirium in older patients. Delirium, an episode of sudden confusion, is a serious medical condition that can occur following surgery and is associated with complications resulting in longer hospital stays, delayed rehabilitation, and other factors that can adversely affect an older person’s surgical recovery and longer-term mental and physical health. Dr. Friedberg is the developer of propofol ketamine (PK) technique designed to maximize patient safety by minimizing the degree to which patients need to be medicated to create the illusion of general anesthesia, i.e., “no hear, no feel.” Located in Los Angeles, Dr. Friedberg has been interviewed by FOX, CNN, truTV, Nancy Grace and People magazine, and commented throughout the Michael Jackson murder trial regarding the use of propofol.